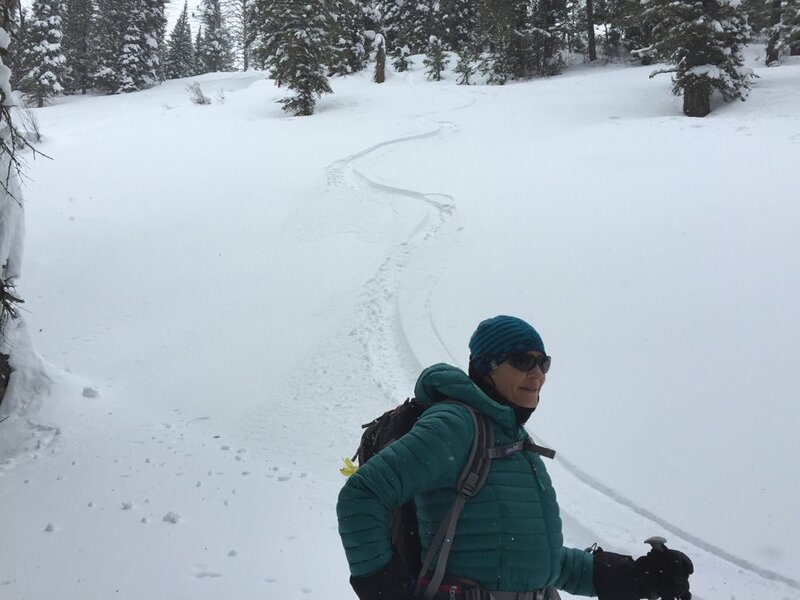 Now that the snow is settling, and many of the trails have been broken, more and more skiers and putting down lines in Teton backcountry. As a result, we went into Burbank looking for some solitude, and we found it. We also had to break trail all the way in and up. Unfortunately, the high winds have been changing the snow. What was perfect snow yesterday was a bit wind affected today. It wasn’t bad snow, but after yesterday’s perfect 10 rating, a bit of a let down. I’m much fussier than my partners: they thought it was pretty good. But I could detect a noticeable lack on enthusiasm in the group: they were still grinning, but not like idiots. All good fun though, and we didn’t seen anyone but a mother and baby moose that are living there this winter. We have seen them 3 of the 4 times we’ve been in this area. It’s good the see they are doing OK in the isolated area. They have a nice stream and very little human traffic to bother them. As a result, they have no reason to go near the highway.